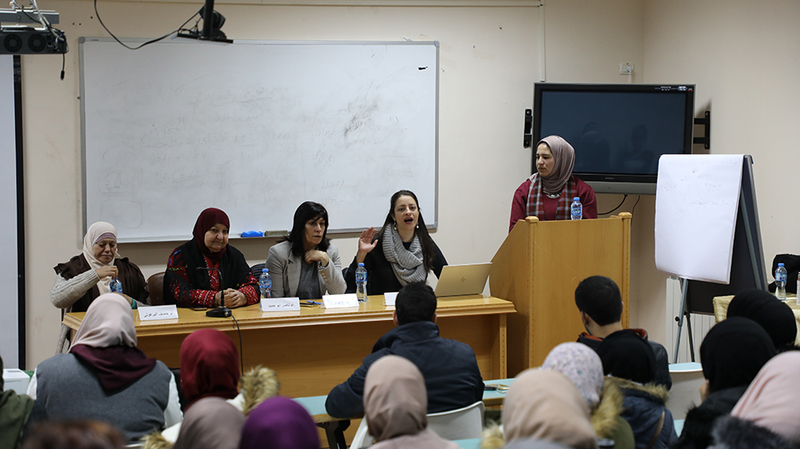 Birzeit University students, professors, and staff members celebrated the role of Palestinian women in the struggle for an independent Palestinian nation in a symposium organized by Together for Change, an independent Palestinian youth group supported by Birzeit University’s Center for Development Studies, on Thursday, March 14, 2019. 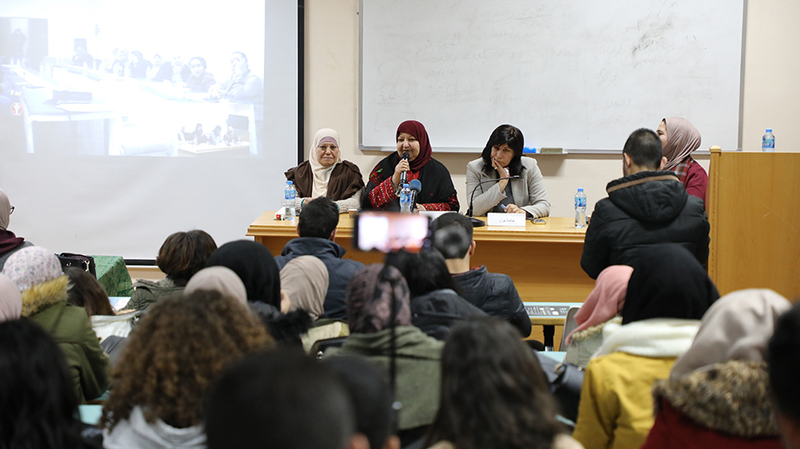 The symposium, held a week after International Women’s Day, honored the achievements and sacrifices of Palestinian women who lost their freedom and beloved family members in their struggle for a free Palestine. Dua’ Badawi, a Together for Change activist who joined the symposium from Gaza via videoconference, gave a brief introduction of the youth group, explaining that it aims to bolster national identity among Palestinian youth and aspires to create a national consciousness that is able to surmount the fragmentation and division created by the occupation and combat its various detrimental effects on Palestinian society, politics and culture. In her opening remarks, Lena Meari, director of the Institute of Women’s Studies at Birzeit University, discussed the role of Palestinian women in the Palestinian quest for freedom, noting that the Palestinian women’s movements emerged along with Palestinian national liberation movements and adopted the same goals. 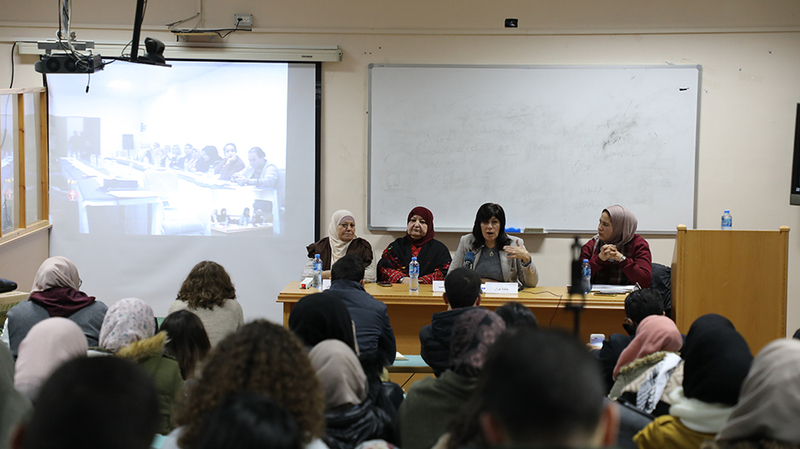 Meari applauded the concept behind the symposium that places International Women’s Day within the context and history of the Palestinian struggle for liberation. “While International Women’s Day celebrates the social struggles of women worldwide, our society must celebrate the political and social achievements of Palestinian women and honor their sacrifices,” she added. Tracing the history of women’s political movements in Palestine, Meari noted that women have been as politically active as men since the early years of the British Mandate era, when they started associations and unions to resist the British occupation. Iktimal Hamad, the chairwoman of the women's committee of the Higher National Commission of the Great March of Return and Breaking the Siege, spoke via videoconference from Gaza on women’s participation in the mass protests against the Israeli occupation, highlighting the fact that women are active participators in the Palestinian quest for independence and stand shoulder to shoulder with men in the border protests. Khalida Jarrar, a prominent Palestinian feminist and human rights activist and a member of the Palestinian Legislative Council, discussed her experience as a political prisoner in Israeli jails and detention centers. Jarrar detailed the inimical measures taken by the Israeli prison authorities against female Palestinian prisoners, such as turning on the cameras in the prison yards in a direct violation of the prisoner’s privacy and forcibly transferring Palestinian prisoners to other administrative sections or detention centers that lack essential facilities and thus do not fulfill basic human needs. These measures, however, were faced with increasing resistance by Palestinian female detainees - 45 in total - who staged strikes, the longest of which lasted for 63 days. “While imprisonment changes the dynamics of resistance to the Israeli occupation, we’re still actively participating in the struggle for Palestinian independence,” said Jarrar. Latifa Abu Hamid, a Palestinian activist, detailed her experiences as a mother whose nine children all have been detained in Israeli prisons, whose one son was killed, and whose house has been destroyed four times by the Israeli occupying forces. She recalled how the Israeli forces detained her for five hours, calling her a terrorist and the mother of a terrorist.